The Shree Gopal Unit (SGU) of BILT was experiencing inconsistency in performance for several years. With the help of the Anaar Roadmap, the management team of SGU transformed the work culture of this over 2000 employee unit by making cross-functional teamwork and employee involvement a way of life. Using the Anaar Strategy Integration Process, numerous constraints were identified and the constraints were removed by using the Anaar Continuous Improvement Process. As a result the unit achieved consistently higher production and profits. Ballarpur Industries Limited (BILT), a US$ 600 million enterprise, produces writing and printing paper. SGU is one of the units of BILT, and has been in existence for over 60 years. The activities involve procuring wood from forests and plantations, converting wood to pulp, then into different grades of paper rolls, followed by finishing operations, packing and finally transporting to customers. It is a fairly complex process. Some of the equipment is very old and some new equipment has been added. The workforce is well trained and highly competent. The products of SGU are known for their superior quality, and demand exceeded production. Annual sales for the unit were about $80 million. While being profitable, the unit had been experiencing ups and down in its profits. The month to month variation in profits was quite large and unpredictable. The unit, as was the case with the rest of BILT, was run in a traditional management style. Anaar was contracted to apply its methodology. 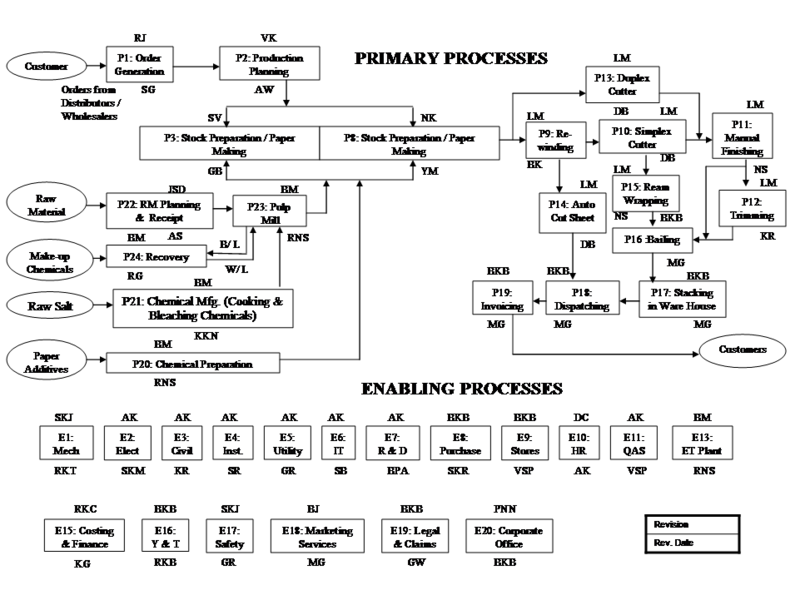 At the beginning of this initiative, the top management of the unit, led by its Unit Head, went through the Anaar Roadmap training, and developed a global process flowchart of the entire operation, as shown in Figure 1, consisting of 26 primary processes and 20 enabling processes. For each process, the names of its sponsor and process leader were shown at the top and bottom of the box, respectively. Each of the process boxes were expanded, as described in the Anaar Process Review System, to show macro and micro processes, internal and external customers, their expectations and what was being delivered to the customers. For the next fiscal year, the business unit’s top management utilized the Anaar Strategy Integration Process for developing their Annual Business Plan. They selected seven focus areas – pulp production, paper production, profits, customer satisfaction, employee motivation, corporate social responsibility and energy conservation. Armed with data collected by the process owners, the management team – consisting of all the sponsors and process leaders shown on the global chart – worked in cross-functional teams and identified what in the current way of doing things was constraining the performance of the business unit, identified improvement projects that needed to be initiated to remove the constraints, and mapped these projects in to appropriate processes on the global process flowchart. Cross-functional teams were formed for all the projects identified in the strategy integration process. 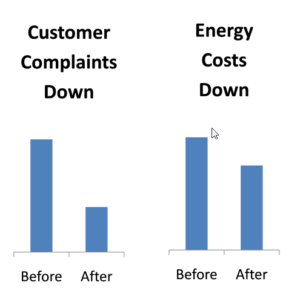 The teams pursued the 7-stage Anaar Continuous Improvement Process – identifying internal and external customers and their expectations, collecting data on what was being delivered, brainstorming on potential causes for any shortfall, identifying root causes based on further data analysis, brainstorming on potential solutions, and then piloting solutions to eliminate the identified root causes, thus improving the performance of selected processes. When things went wrong, the managers started asking relentlessly “where did our processes break down?”, and not “who did it?” This change in the mindset of the managers brought in a sea change in the attitude of the employees. They began to feel more empowered to suggest changes. A system of reviewing improvement projects was put in place – the unit head, along with all functional heads, would review at least one improvement project every day. All the team members of the selected projects were invited to attend and participate in the presentation and discussion. The primary focus of the review was to listen to, understand and guide the teams as they progressed through the 7 stages of the Anaar Continuous Improvement Process. These review meetings nurtured team spirit throughout the organization, starting at the highest levels. The unit head mandated that these review meetings be held every day, whether he is in town or not. The importance of these improvement projects was visibly demonstrated by the commitment of the top management. Employees at all levels had an opportunity to interact with and present their views and ideas to the top management thus creating a more open work culture. Numerous ideas for solving identified problems were suggested and implemented with a sense of pride and excitement. I t is important to note that over 80% of the sub-approaches required active involvement of employees from processes other than where the constraints were faced. Previously, employees focused on meeting their departmental budgets – the budgets were sacrosanct. Now, they focused on meeting their internal customers’ needs. Working in a cross-functional setting, and following the Anaar Continuous Improvement Process, the problems that existed for several years were resolved. Employees came up with many innovative ideas to remove the root causes. Many departments had to spend more than what was budgeted, but the unit as a whole made more profits than ever before! 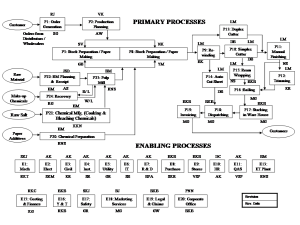 By the end of the year, about 165 projects were completed in 35 different processes of the global process flowchart. 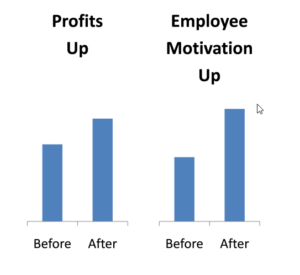 There was improvement on all the 7 business goals – production and profit records were broken regularly; customer complaints decreased by 80%, energy costs decreased, CSR activities were more focused and gained national and international recognition; and employee motivation increased substantially. Profits – as measured by Delta EVA – were up by about 25% over the prior year, and most importantly, profits were consistent from month to month. The higher levels of profitability were sustained in the following years.